It’s not every Summer you come across a deal this great! 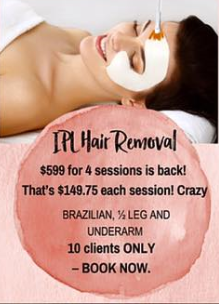 Currently, Beautyologist is offering IPL Hair Removal sessions for a crazy-low price to the first 10 clients who book. At just $599 for 4 sessions- you can’t afford to miss out!